Your invoice can only be as good as its payment terms and conditions. Your terms and conditions need to be crystal clear so you are able to communicate effectively with your customers and can also collect timely payments. These can include payment due dates, preferred payment method, incentives for early payments, and even consequences of late payments if you like. You can make them as extensive as you want. 1. What are payment terms? Payment terms are the conditions under which a seller will complete a sale. Typically, these terms specify the period granted to a buyer to pay off the amount due. They may also ask for cash in advance, cash on delivery, a deferred payment period of 30 days or more, or other similar provisions. In short, payment terms can be used to help businesses receive payments on a predictable schedule. The Payment Terms feature in EZRentOut gives you greater managerial control over the payment specifications of an order; it allows you to set and edit the due date for customer payments and sets up warning alerts for overdue payments. To start configuring your customer payment terms, go to Settings → Add Ons → Payment Terms → Enabled. Once you’ve enabled it, admins will be able to add/edit/delete payment terms. Additionally, they will be able to associate payment terms with customers – and set up a payment term for each customer. Once created, a Payment Term i.e. Payment Due Date will appear on the Order Details Page, depending on its nature i.e. Default or Customer-Specific. Note: If the ‘Allow users to edit payment due date in the order’ setting is enabled, staff users can also edit payment due date on orders assigned to them. Below, we’ll take you through the process of how you can define payment terms for your customers and apply them in multiple orders. In order to create a payment term, you will have to go to Settings → Add Ons → Payment Terms → Click ‘Create New Payment Term’. A dialogue will appear. 1. Once the dialogue opens, define a name for your new payment term. 2. 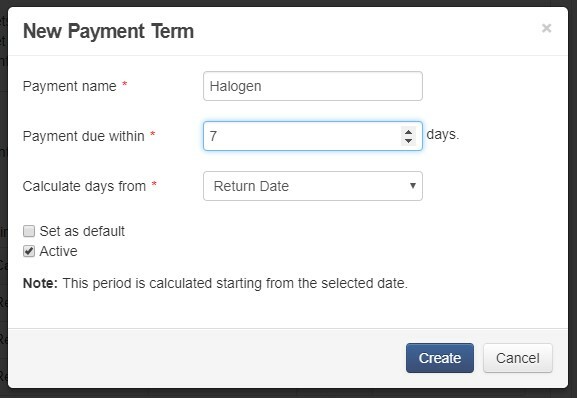 Next, specify the payment due period by filling in the field for ‘Payment due within ___ days’. This will specify the grace period allowed to customers for completing the payment after which it becomes overdue (more on this below). 4. Mark your Payment Term as ‘Active’ so it can be used. Active Payment Terms are also available for selection from the Customer Details Page so you can easily associate them with a customer. Inactive Payment Terms do not appear on a Customer Details page. 5. Select the payment term as ‘Default‘ if you want to apply it to all existing and new customers configured to ‘use company default payment term’ in their Customer Details Page. You can verify this by going to the Customer Details Page and editing their Payment Term Settings. All customers have this checkbox enabled by default but you can uncheck this and choose a Payment Term of your liking or none at all. 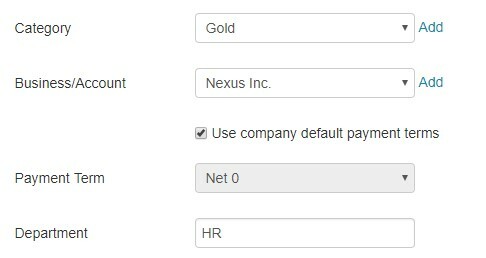 Notice that the Payment Term dropdown will remain locked as long as the Company Default Payment Term is enabled for a customer. If you have the Company Default Payment Term unchecked for a customer, any new Payment Terms that you set as default will not apply to the said customer. If you create a Custom Payment Term by not selecting the ‘Default’ checkbox, it can be linked to a customer from their Customer Details Page. This freedom helps you design customer-specific Payment Terms. For their ease, we want to offer them a payment due grace period of 7 days after they return a rental to us. To set this up, we choose the payment due to be within 7 days, starting from the Return Date. Since we only want to apply this to customers working at Halogen, we will not set it as Default. Now, if an employee from Halogen, say Andy Samuels, rents out a set of ski equipment on June 1st and returns it on July 1st, the payment will be due on the 1st of July and can be paid till the 7th of July. We’ll discuss different case scenarios regarding default, active and inactive Payment Terms later in this blog. Payment Terms need to be linked with customers for them to work on an order. In this manner, a Payment Term linked with Sarah Marshall will be applicable to all Active Orders for Sarah Marshall. You can either create Company Default Payment Terms or Custom Payment Terms which are specific to certain customers. Link a payment term to a customer by editing their details page. Uncheck the ‘use company default payment terms’ checkbox to unlock the Payment Term dropdown menu and choose your preferred payment term. When you use Company Default Payment Terms for a customer, the most recent and active Default Payment Term is linked to the customer. Whenever you create a new Default Payment Term, you override the previous one. This change will be applicable to all customers that are linked with a Company Default Payment Term. Note: You cannot choose a custom payment term for a customer if company default payment term is enabled for that customer. If you do not want a Payment Term linked with a customer, you can edit their Customer Details Page by unchecking the ‘use company default payment term’ checkbox and setting the ‘Select Payment Term’ option as the Payment Term. This means that no Payment Term has been selected. In cases where you don’t want a Payment Term to be used in an order, you can inactivate it from Settings → Add Ons → Payment Terms. Or simply disable the Payment Terms Add On if you do not wish to apply payment due dates to any of the orders. When linking a payment term to a customer, only active payment terms are visible in the dropdown menu when choosing one. Additionally, when a Payment Term is marked as inactive, it will be delinked from all the associated orders. This one is applied for all customers, except the ones that already have a specific payment term linked to them. In company default payment terms, the most recent one is applied. It overlaps all the other default payment terms previously created. This will delink payment terms from all the orders, except the ones that already have a specific payment term linked to them. Company default payment terms will be set for customers that are created from the Webstore. There are two kinds of payment states in EZRentOut; Payment Pending and Payment Overdue. Once payment becomes due on an order, an additional label is attached to it called ‘Payment Pending’. Your Payment Term defines when this label appears with the order. Up until you reach the date specified in your Payment Term (we mean the ‘Calculate days from’ field), this label will not show. Let’s consider an example using the same Payment Term we just drafted in section 4 called Halogen. So, Anna Mull is Halogen’s employee and she is renting our ski equipment. The equipment was rented out on November 1 for a duration of 1 month. This means that payment will be due from December 1 and can be collected till December 8 without a late fee (if you do accept one). The above image doesn’t show the Payment Due Date since it isn’t yet time for the return (remember, according to the Halogen Payment Term, payment will become due after the Return Date). Now let’s see what happens when the Return Date is reached. -There’s a Payment Pending label next to the ‘Rented Out’ state label. -There is now a Payment Due Date of December 8th. This means that the payment is pending on the customer, and it can be submitted any time before December 1st. But what if this date passes? – The Payment Pending label changed to Payment Overdue. – The Payment Due Date becomes red (to indicate that it has passed) and small alert is attached with it. To view Payment Due Date for a customer’s order, a Payment Term must be linked with the customer. Once you do that, the payment term will appear on all Active Orders for the concerned customer. Below are some scenarios regarding payment due date periods and categories. We’ll also take you through the behavior of an order when its payment due date is edited. Note: In all examples below, we assume that the payment period starts from the ‘Rent Out‘ day. As explained above, you can set it to any day as per your payment collection policy. Payment due within ‘0’ days. Starting from the ‘Rent Out Date‘. Set as both ‘default’ and ‘active’. So, if Catherine rents out an item on July 23rd, she has to pay on July 23rd as well. Payment due within ‘1‘ day. Uncheck default and make the Payment Term ‘Active‘. Link this Payment Term to the customers of your choice. We linked this Payment Term with Customer Ryan. An order has been rented out to him on July 23rd, so the calculated payment due date is July 24th. With the same specifications as 5.2, if Ryan rented items on July 20th, the payment due date would be July 21st. 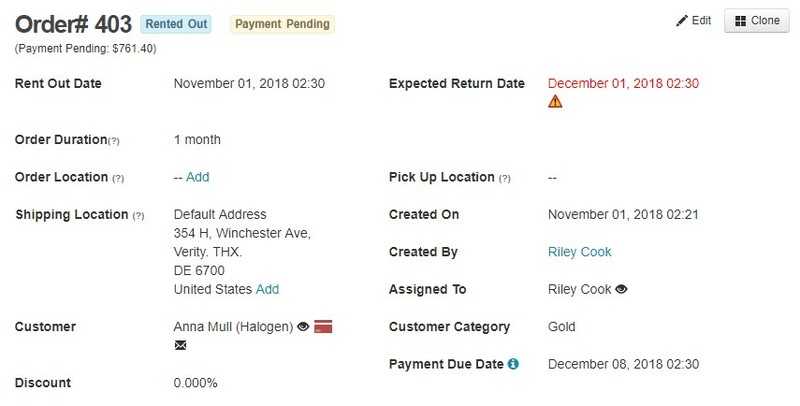 If the customer fails to make the payment or the payment has not been fully paid by July 21st, the Payment due date field will be shown in red with a warning sign. No matter what the rental period set, a payment due date can still be applied to it. Past orders in rented out or returned state will also show Payment due dates. If a partial payment has been made on an order, the payment due date defined will still be visible. A ‘Payment Pending’ label will be attached with it. If there’s no payment term linked with a customer, the Order Details page will not show any payment due date and no payment labels (pending or overdue) will show on the order. As mentioned above, admins and owners have the ability to add, edit and delete a payment term by default. They can also make changes to a payment due date from within the Order Details Page. FAQ 1: Why is editing a Payment Term helpful? It is effective to apply payment due dates on orders but sometimes, you want to give that extra leverage to regular customers. Now a Payment Term has been linked to a customer but you want to extend it. You can do that from the Order Details Page. -Example: Customer A rented out an order on July 20th but couldn’t manage to either pay partially or fully. You can extend the payment due date however you like. We will be changing it from July 21st to July 30th. Click on ‘Payment Due Date’ field, and update the date. FAQ 2: Does this change affect the Payment Term and other associated orders? The above change will only be applicable to the order where it has been made. No effect takes place on the defined Payment Term or orders associated with it. You can always edit the Payment Term by going to Settings or link another Payment Term with this customer to change the Payment Term for all orders associated with the same customer. FAQ 3: What happens when I delete a Payment Term? On deleting a payment term, changes will also take place accordingly in the associated customers and related orders. If you deleted a Default Payment Term, the previous Default Payment Term will be now be set as the current default. No Payment Term will be attached to customers using a customer-specific Payment Term if you delete it. Recurring invoices guarantee cash flow for your business, make forecasting a breeze and save you time by saving you from having to invoice clients each month. This monthly payment reduces the uncertainty associated with cash influx for a company. Recurring orders are part of the basic order management in EZRentOut. For this reason, the payment due dates are also visible in recurring orders. Customers can also view Payment Due Dates on their ‘Rented Out’ and ‘Returned’ orders from the Customer Portal. However, they cannot make any changes to the Payment Terms. You can customize the Orders listing page from the 3 vertical dots and show ‘Payment Due Date’ column for each order separately. You can also apply filters to the Orders Listing Page, sorting them based on their payment due dates. Following email alerts are generated and received by all admins. Staff users that are being assigned to orders with active payment due dates and customers associated with these orders also receive the same alerts. You can enable these alerts from Alerts → My Alerts/Customer Alerts/Staff Alerts. Payment due in __ days: Orders that are due for payment in __ days. Payment due today: Orders that are due for payment today. Payment overdue: Orders for which payment due date has passed. You can also get into more insights that involve payment due dates from More → Reports → Order Reports → All Orders → Set a period in ‘Payment due date in these days’ section (see image below). Similarly, you can also find customer-centric insights that involve payment terms from Reports → Customer Reports → All Customers → Choose a ‘Payment term’. These reports can be filtered. You can export these reports to CSV format or upload them to your Dropbox account. While importing customers into your EZRentOut account, you can map a column for ‘Payment Term’. Define Payment Terms seamlessly with EZRentOut! When creating Payment Terms for customers, remember to design clear, concise and consistent terms so you don’t have to worry about payments and receive customer dues on time. When you have a fixed payment schedule defined, you can easily create a budget and make financial forecasts in order to prevent any cash flow problems. EZRentOut is a rental management software that helps thousands of businesses manage rental orders, track equipment, improve customer satisfaction, and streamline processes all over the world. Sign up for our equipment rental software today and enjoy a free 15-day trial or drop us an email at support@ezrentout.com for help!